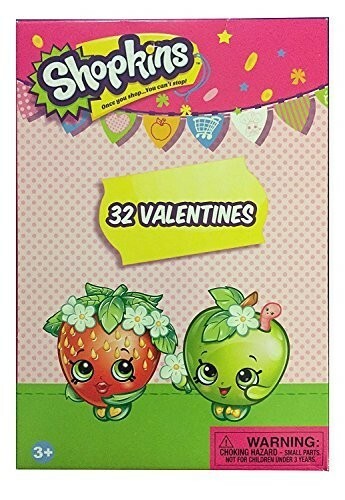 Shopkins Valentines Day Cards for Kids Toddlers -- 32 Shopkins Valentine Cards (School Classroom Boxed Pack). This boxed Shopkins Valentine card set features designs with favorite Shopkins characters. These Valentine cards for girls and boys alike are the perfect handout for Valentines Day parties. 32 Valentines -- enough for most preschool or elementary school classroom settings. Shopkins Valentines Day cards for kids and toddlers measure 4.5" x 2.5". Officially licensed Shopkins Valentines Day cards. This product is listed on amazon using an ASIN of #B01N7MSI0D	with an original MSRP	of $5.49	. Product prices and availability are accurate as of February 11, 2019 and are subject to change. Any price and availability information displayed on Amazon at the time of purchase will apply to the purchase of this product. Certain content that appears above comes from Amazon Services LLC. This Content is provided 'AS IS' and is subject to change or removal at any time.